This weekend was Ashley's 10th Birthday Party. It was a intimate group of 7 girls who all attended elementary school together. The girls haven't seen each other in a bit, but for girls even a week of separation is an eternity. As the birthday girl, Ashley requested pizza. I then created a menu around that. Thus, cheesy bread sticks, garden house salad, individual rustic marinara and pepperoni pizza, red velvet cupcakes with a cream cheese frosting, and to wash it all down with, a strawberry spritzer! I arrived at Ashley's home all equipped of course, aprons in hands, recipes etc. The girls of course came prepared too--with excitement. We hit the kitchen island and were off discussing the evening's menu and what we were going to tackle first--the bread stick and pizza doughs! The girls learned to properly measure flour, to keep wet from dry ingredients separate--all the little details that make all the difference. I must say, as items came out of the oven I was proud of each of them for doing such a splendid job! The food looked delicious and from what I gather, tasted even better (especially the cheesy bread sticks!) At the end of the 3 hours, they were finishing up eating the cupcakes they not only made, but decorated. Then they would be off to play! I cleaned up and began packing. Once done, I said goodbye to the girls and asked them their favorite menu for evening. After wishing them well, I was off! It is funny how much thought and planning goes into an event and how quickly it all unfolds. Everything matters, attention to detail is crucial. It's what allows the timing to go well and the food to be delicious. I am very grateful for a successful birthday party and was honored to be asked to celebrate Ashley's birthday! I wish her the best, and hope her life continues to be surrounded with good food and even better company. I hope that when she gets older this birthday takes on some significance. It has in my life! As fall officially marked its spot on the calendar my mind instantly reminisced on summer. It wasn't much of one, we had what seemed like a lot of rain and thus gray days and at other times just blah days. In my opinion summer only hit the last two weeks of it leaving, we had great weather as if summer was saying its final goodbye. 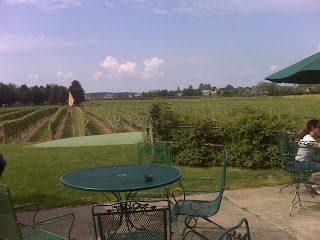 One of those two weeks Alex and I went to Duckwalk Vineyard in Long Island. We must have gotten there just in the nick of time because the lady was announcing last calls on a walking tour. While we have visted Duckwalk for a couple of years now, we ever actually took a tour. So, Alex and I chimed in! We got a brief history on the vineyard, how they ferment their wines, the type of system they used to make the actual bottle possible. "Our award-winning wines are quite literally dreams come true. It was the dream of our founder, Dr. Herodotus “Dan” Damianos, that helped create the winemaking industry on Long Island in the early 1980’s. In 1994 he and his son Alexander founded Duck Walk Vineyards. The Normandy Chateau-style building in Water Mill, a true Hamptons landmark, became home to what has quickly evolved into one of the most well-known names in Long Island wine....producing 35,000 cases a year." The whole tour was neat! 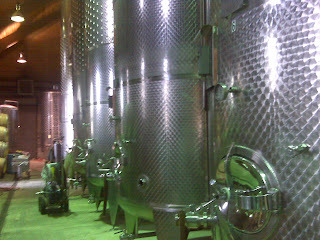 Without it I would have never realized how big the store was that it could even encompass the production of their wines. Naturally, as soon as the tour was over all the guest ran to the bar to purchase a sampling of 6 wines of their choice. Alex and I did that before, (and greatly recommended it!) so instead we simply purchased our all time favorites which include: Aphrodite, Gatsby Red, Chardonnay, Windmill Blush, Boysenberry, and Blueberry Port. After grabbing a box of wine it was one last look of the beautiful vineyard and into the car to continue our cruise of the Hampton's for the last time this summer. Although we all hate to see summer go--especially knowing that winter is just around the corner--you can continue to hold to summer through the warmth of wine. Duckwalk Vineyards gladly delivers within New York state. Cheers! If there is something I should share is my HUGE fear of flying. This comes after an incident my family and I experienced when I was 14. This fear has kept me from traveling, even though deep inside I know it would cause me to miss out on a lot of the world. My aunt constantly reminds that: One, there is more of a chance of dying in a car accident then there is on a plane. Two, that if its my time to go, then its my time to go--simple as that! Well, last year a friend of mine, her sister, Alex and myself went to Los Cabos, Mexico. Talk about facing fears--quite a long plane ride for someone like myself. Well since I got flying back into my system I didn't want to let a year go by without traveling again this way the fear wouldn't have time to rebuild. So Alex and I booked a trip to Florida. Originally we planned on going to Miami, not for the club scene but because after seeing Weekend Getaways with Giada De Laurentiis I was instantly interested in the colorful city. However, a dear friend of mind suggested going to Orlando and then heading to Miami--that sounded like a spectacular plan! We were scheduled to stay two days in Orlando with my aunt and finish the rest of the week at the Loews Hotel in Miami. Talk about excited! As soon as we touched ground--and doing a silent clap to the captain (a practice that actually took place by all passengers some time ago--I was ready to hit Disney's Magical Kingdom! So we got our car rental (Budget--never again) and our GPS and off we were! Going back to Disney, Alex and I stood at the park till closing. We watched the parade and then the fireworks by the castle. In a word....Amazing! While we had a fantastic time in Miami, nothing offered the magic and sense of beauty like Disney. So for all of you who may fear flying please don't allow it to stop you from seeing the world....in the case the magically world of Disney! As with many New Yorkers, it is very hard to start the day without the morning jolt. Trust me, you don't want to talk to me before my first cup of coffee! I take my first cup of the day seriously which explains why I make mine every morning at home, as my family has--in a percolator. As for beans or coffee brands, Sanka, Maxwell House, Chock Full of Nuts, nope! It's Cafe Pilon or Cafe Bustelo (preferably the latter!) for me! Both are strong coffees without the bitterness, alongside steamed milk and a little sugar and I have satisfied my morning bliss. Of course there are times you need an afternoon pick me up. Instantly coffee chains starting with an S or D come to mind. The problem: While they do quench your desire for a cup of coffee they certainly don't satisfy it. This isn't good. I don't want a coffee that is bitter or that is handed to me in a rush to get to the next customer. I want coffee that is rich, indulging and just damn right delicious! You would be surprised the difference a little patience, a little love from the barista, and a couple of precious minutes of waiting time, make towards a fantastic cup of coffee. Thus, I was delighted when I came across Joe The Art of Coffee! It's an intimate coffee house with 5 convenient locations in NYC. You can choose to have your coffee served in a paper cup or in an actual mug! (I prefer the mug.) I get a large cappuccino--for the same if not cheaper price you get at the chains, but an experience that cannot be explained. The coffee--as it should be--is luxurious! Creamy, delicious, foamy to the point that you actually savor it and then contemplate another just out of greed. It is that good! Not to mention that the barista actually creates designs in your coffee with the lather. Remember we eat with our eyes! Lesson to be learned: Rather that head to the coffee chain on every street corner, why not get the quality you are paying for. Sit down, if you have the time, or grab a deliciously noteworthy coffee and at the same time support a private coffee house that treats you like an individual. You have nothing to lose but the extremely long line! But in those times Joe's seems a bit out of reach, then by all means grab the alphabet--I won't tell!